Bulawayo soccer giants, Highlanders, are living a revival dream of a beautiful season after four of the teams’ players were selected to don the 2012/13 soccer stars calendar. 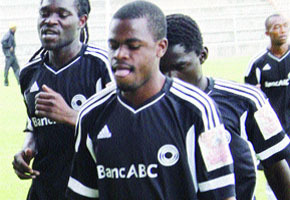 Dynamos and Chicken Inn contributed two players apiece. In Tawanda Muparati’s absence, Highlanders’ Masimba Mambare is now the red hot favourite for footballer of the year gong. Enjoying a two point lead ahead of the Bulawayo giants, DeMbare might be in with a chance to land the championship title, but the calendar will reflect Highlanders were the season’s luminaries. Masimba Mambare, Mthulisi Maphosa, goalkeeper Ariel Sibanda and Innocent Mapuranga will parade the zebra stripe for iBosso yiBosso, while dependable defender Patson Jaure and the enterprising Denver Mukamba will feature for DeMbare. Chicken Inn, who certainly were a marvel to watch during the season, provided Kudakwashe Mahachi and Felix Chidungwe. Monomotapa, Shabanie and Hwange provided a single player each and they are Ronald Chitiyo, Nelson Mazivisa and Rodwell Chinyengetere. A panel of 43 selectors comprising sportswriters, coaches and footballers union members made up the selection panel. Meanwhile, the Asiagate scandal took huge impact on the selection of the soccer stars finalists. The Soccer Star of the Year winner and his two runners up will emerge from the 11 finalists. The Goalkeeper of the Year, Rookie of the Year, Coach of the Year, Top Goal-scorer and Most Disciplined Team will also be crowned at a banquet set for the 7th of December in the capital.